This craft is both rustic and green as it uses dark glass leaf beads with thin natural jute string and recycled toilet paper rolls. It’s a simple way to make a festive table that hardly costs a thing. I think almost everyone has materials on hand to make these easy DIY napkin rings. 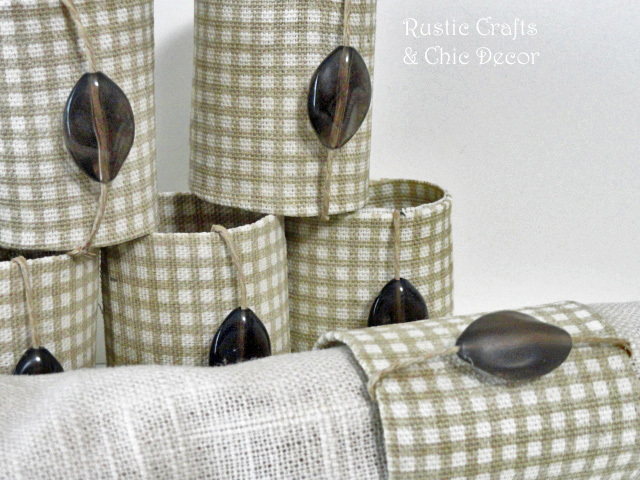 The base material is of course the toilet paper roll but you can also use wrapping paper tubes or paper towel tubes. It doesn’t take much fabric to cover the tubes so just some scrap leftover from a sewing project would suffice. If you are not a sewer, an old shirt is a great resource for some cool fabric. And, if you love of all of your shirts and have no scraps, you can always go to a fabric store and purchase swatches of fabric for real cheap. I like to embellish with beads and especially like the glass leaf beads for a rustic touch. If you were making these for a Christmas table, you might want to use mini rusty jingle bells to embellish or for poker night – maybe some dice beads? You can have so much fun with all of the variations. Measure and cut two inch lengths of tube with razor knife. If you are using toilet paper tubes, you might just want to cut each tube evenly in half since the entire tube is only 4 1/4 inches tall to begin with. That way you only have to make one cut. I used toilet paper tubes and made two cuts for each one. Not sure why! Sometimes I drive myself crazy! I hate to deviate from an original plan I guess. Cut out one section of fabric for each two inch tube. It should measure four and 1/4 inches wide. This is enough to cover the outside and fold over to the inside plus a little overlap. The length of the material should measure enough to go all the way around the tube plus overlap just a little. Start spreading glue on a section of the tube. Press the fabric onto glued area, overlapping 1/4 to 1/2 inch on one end and the larger overlap on the other end. Continue adding glue and pressing down fabric. When you get to the end make sure the overlapped edge is sealed well. Now place a bead of glue on the inside edge of the smaller overlapped fabric side. Press this fabric in. Do the same for the other side making sure all the overlapped edges are completely sealed. Let dry. Once the napkin ring is completely dry, string a bead through some jute and tie it to the ring with the knot at the inside. With some hot glue, secure the knot in place and also the bead in place at the front. Now invite some guests over and enjoy a nice dinner with a festive table! Very clever and look so fab. Hey, it sure beats paying even a minimum of $5 for each ring. I bet they are more these days also. I am sharing this on my FB page.. thanks & I am Sheryll. Thank you Sheryll! And, yes you can’t beat the cost savings :). I’m so excited to see this! I plan to make clothe napkins soon and these will be the perfect matching project. Thanks for the great idea! A matching set sounds fantastic! Let me know how they turn out! Finished! I’d LOVE your feedback if you get a chance to look at them.